Successfully Added Huawei Mate 8 Smartphone - Kirin 950 Chipset, 6 Inch Display, 4G, Fingerprint Sensor, 3GB RAM, OTG, NFC (Black) to your Shopping Cart. One of the many unique features this smartphone has is its epic chipset. Holding the Kirin 950 chipset that comes with two sets of cores, the ARM’s Cortex A553 and A72 that have been clocked at 1.8 and 2.53GHz, along with a stunning 3GB of RAM this Android phone offers you a performance like no other. Immensely powerful the Mate 8 can handle games, multi-tasking, and anything else you throw at it without dropping a single frame. So head out to the play store and download the latest Apps, games, and FHD movies – with this Chinese smartphone you will be able to enjoy all media and mobile entertainment to the absolute most. To ensure that you’ll be able to enjoy all the features this Android smartphone has to offer, huawei is treating you with a screen size no less than 6 Inches. This 6 Inch full HD display is bigger than the screens you will find on most rival phones and, with its 368PPI pixel density, truly gives you a platform that portraits vivid colors and high detail – letting you enjoy your games and videos in stunning detail. With 32GB of internal memory and supporting up to 128GB of external storage the Mate 8 smartphone is guaranteed to offer enough storage for all your files and entertainment. A massive 4000mAh battery that offers up to 5 hours of usage time ensure that you can get through a day filled with mobile entertainment without needing to worry about battery life. Coming with a fingerprint scanner this Android phone lets you easily unlock your smartphone with the touch of a finger and allows secure storage for all your files and pictures. With its built-in 16MP camera, the Mate 8 smartphone allows you to snap breathtaking images where ever you are, ensuring that not a single memorable moment will ever be forgotten again. Supporting 4G connectivity and Dual-Band Wi-Fi this Chinese phone offers you the fastest data speeds available on the mobile market, allowing you to stream online movies and download files in the blink of an eye. With the phone’s Dual-IMEI numbers it allows you to be connected to two network providers simultaneously, ensuring that from now on you’ll never be out of reach for your friends and loved ones. 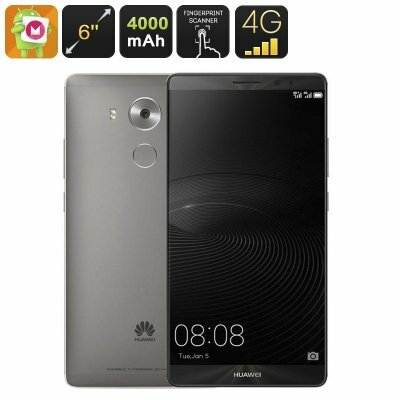 The Huawei Mate 8 comes with a 12 months warranty, brought to you by the leader in Android smartphones as well as wholesale electronic gadgets..